Ask the local Thai’s about the weather in Phuket and you usually get an answer of "same same but different" maybe some rain later. However, you will find the weather is more predictable then that, for planning your holidays in Phuket. 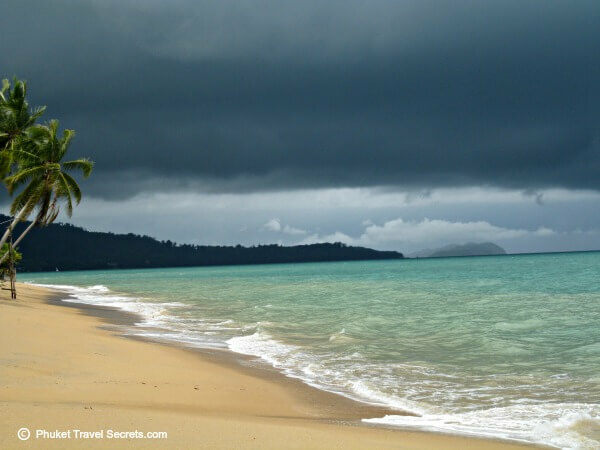 There are two seasons in Phuket the dry season and the monsoon season otherwise known as the rainy season. You will find the weather is fairly consistent all year round with temperatures that you expect in a tropical climate. Throughout the year there are certain months that experience more rain than other months. Below you will see an up to date 5 day weather forecast and a longer 15 day weather forecast. You can also check Satellite imagery or watch videos of the weather in Phuket. For Phuket weather updates you can check the live webcams at Karon Beach and at Koh Yao Island looking out over Phang Nga Bay. If you would you like to know what was voted the most popular thing to do in Phuket on Trip Advisor? Click Here to visit Trip Advisor to find out more. The most popular time for visitors is usually in the dry season which usually begins at the start of November and goes through to February/March each year. During this time of the year the weather in Phuket is usually fantastic. You will enjoy the clear blue skies, calm seas, with the cooler temperatures averaging between a low of 24C (86F) to 32C (90F) with lower humidity levels. You may encounter the odd shower, but nothing like the monsoon season. If you are planning your vacation to Phuket during this time make sure you book your accommodation early, especially if travelling from December to January. Based on the weather this is one of the best times to go to Phuket, however you will have to put up with the crowds, booked out restaurants and the slightly higher prices. Around the end of March through to May is the hottest time in Phuket with the average temperature rising from a low 25C (77F) to highs of 36C (95F) along with higher humidity. The only relief from the heat and humidity is the frequent thundery showers. If you are planning your holidays in Phuket at this time of the year, you may get to enjoy the Thai New Years Festival that is held on the 13th April. The festival is known as the Songkran Festival, where the locals throw water on each other to celebrate and of course cool down. If you are on the island for the Songkran Festival it is advisable to have some plastic bags to protect any valuable camera equipment or mobile phones from getting wet. I can can guarantee if you are out enjoying the festivities you will get drenched. This is our favorite time of the year to visit Phuket. Another good time to visit and still be able to enjoy the weather in Phuket is the months of May, June, July and August. When the average temperatures are between 25C (77F) to 31C (88F). This is the monsoon or rainy season so you will experience some heavy showers, but with plenty of sun in between. The beaches are much quieter throughout these months as the seas change and swimming can be unsafe. If you do go swimming at the beach take notice of the flags and play it safe, if you see a red flag don't go in the water. You will experience times when the sea is calm enough for swimming and days when you are better off just going shopping or reading a book or swimming in the pool at your resort. The trade off is that the island is not as crowded, there is loads of great accommodation specials and cheap flights to Phuket. You will find it is not as expensive as the high season and we believe it is an enjoyable time to visit the Island. The months of September and October bring the end of the monsoon season with more frequent rain storms that lash the West coast of Phuket. We have experienced some of these storms, nothing better to add to a romantic dinner in a beach-side restaurant than a huge tropical storm rolling in, blowing the rain horizontally in past the tarpaulin drop sheets and the thatched roofs dripping from the deluge of rain. The beauty of it all is the Thai people take it in their stride and still do everything to keep you happy. Depending on the year the weather in Phuket, come late September can change totally. Towards the end of October the weather starts to improve with beautiful sunny days and calm seas. Saying this we have often picked up some cheap flights and accommodation for early to mid October and have experienced a mixture of sunny days and afternoon storms. At this time of the year it is hard to pick what the weather in Phuket will be like. If your looking for more details about each month, we have put together a Phuket weather Month by Month Guide. If you are planning your holiday to Phuket and your not just looking at spending all your time on the beach. Look at grabbing yourself some of the cheap room rates at the Resorts and Hotels that are available for mid year around June, July or August.